WIN: When you stumble out of bed in your undies, open the fridge, and it’s full of beer and pizza. I picked up the fridge, along with other LEGO goodies, from my PO Box on Saturday. It is an old LEGO Fabuland one I won on eBay along with other Fabuland bits and pieces. The little red drawer on the bottom shelf slides open and is removable. I have a feeling this fridge going to become one of my most important props. “WIN!” has been featured at Matt’s Brick Gallery. Thanks to everyone who’s liked and Tumblr’d it. 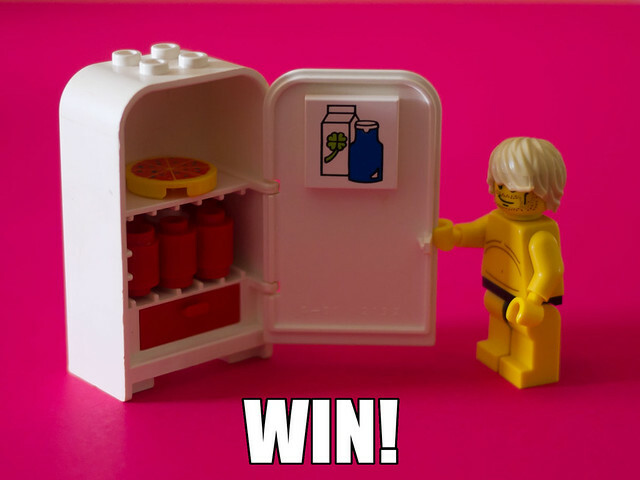 This entry was posted in Humour, The fridge, WIN and tagged fridge, humour, minifig, surfer dude, WIN on 6 June, 2011 by The LEGO woman.